This is a book that I return to from time to time in order to clarify an historical point or opinion. I don't do politics here. But I am an active follower of what is happening in the news. And this book proves that the only thing new is the history you don't know. This book is also essential to understanding not only the history of Post World War Two and how it affects us even today, it is also a passionate history of America. And it is told by the last President to not have a college degree. A failed businessman from the racially divided Kansas-Missouri border who went on to desegregate the Armed Forces while his mother in law (who had been a prisoner of the Union at Andersonville)railed against him as a traitor. 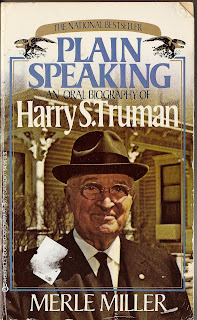 This book will make you feel as if your Grandfather is in the room and talkng to you-it's that personable. His experiences as a Gunnery Captain in World War One are truly captivating. So are his accounts of chasing down graft during World War Two and his battle with Glenn L. Martin over defective aircraft knowingly being sent into battle. His humbleness at finding himself the Leader of the Free World at the close of World war Two is refreshingly innocent. He had been in the dark about the Manhattan Project and now had to make some fateful and momentous decisions. He would more than measure up. The history of the division of the States and the War Between them is fascinating. He was married into a family that had suffered greatly at the hands of Union raiders in the cross border Kansas-Missouri conflict. His mother in law, who despised him as worthless, was a prisoner at Andersonville and he goes into some detail of the horrors she endured there. His first hand accounts of the legendary confrontations with General MacArthur are piceless. His take on the best and worst Pesidents will amaze you in it's logic. A self educated man who had read all of mythology and every classic from Plato on, his unigue take was summed up in this quote; "The only thing new is the history you don't know." This is the man who with a penstroke ensured that Israel would be recognized by the UN in 1947 as an Independent Jewish State. He was greatly influenced in this by an old friend and Army buddy named Eddie Jacobsen. And all this was going on at the time of the Berlin Airlift and the newly founded Cold War! He also created the Middle Class in America with the passage of the GI BIll at the end of the war. His simple vision and common sense attitude is sorely missing in todays political environment-on both sides of the aisle! Like I said, I don't do politics here. This is history and has much to offer in that regard. You will bask in the warmth in which it is served up. And learn quite a bit in the bargain.